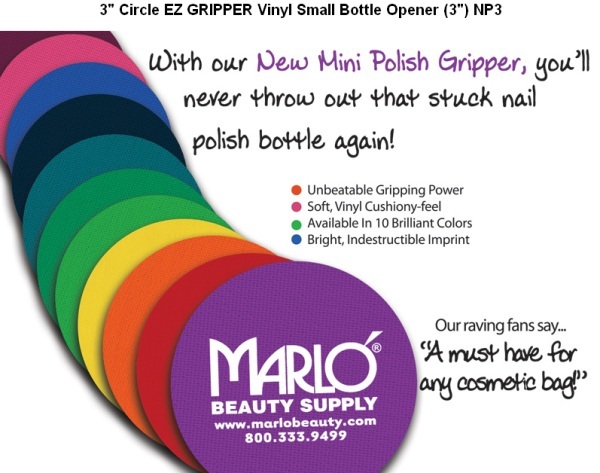 A new mini-version of our great EZ Gripper Vinyl Jar Openers is our 3-inch Round Nail Polish Bottle Openers! These Bottle Openers are made from the same material as our EZ Gripper Vinyl Jar Openers that are softer and stronger than our Rubber Jar Openers - gentler on the hands - yet provides superior gripping power. Free Quotes and friendly customer service. Be sure to order plenty because your customers and friends will want several so they can find them easily in their purse or cosmetic bag. Proudly made in the USA! With our Nail Polish Bottle Openers, no small bottle will be too difficult to open! These mini Bottle Openers also make opening water bottles easier than ever and convenient enough to carry in your pocket. Every time your customer uses them, they will have a positive impression of your salon for your thoughtfulness in providing a great promotional advertising product. Contact us at - (706) 374-0710 - if you need a larger size jar opener, be sure to check out our EZ Grip Vinyl Jar Openers available in many other shapes. Custom shapes are also available for additional charge. Customers love receiving something for nothing. Why not give them something useful - a product that can be used in the bathroom, kitchen, utility room, tool room - anywhere! And your name will be on their mind every time they use it! Vinyl Bottle Openers are an effective advertising product with many uses to keep your name, logo and custom printed message in front of your customer. After your name is impressed upon their mind several times, the person soon memorizes your name. Give us a call - (706) 374-0710 - for other options and a free quote. Mini Vinyl Bottle Openers are available in many colors - Select the vinyl color for your jar opener. We have many colors of vinyl available to select from: blue, navy, white, red, green, lime, yellow, orange, pink, purple, teal, tan, black or burgundy.